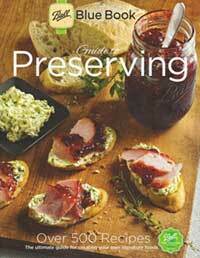 The latest Ball Blue Book Guide to Preserving. A Guide to Home Canning, Freezing, & Dehydration. The Ball Blue Book is an all-inclusive source book on the topics of Home Canning, Dehydration, and Freezing. From the basics to advanced techniques, this guide is sure to please everyone who preserves their own foods. In the pages of the Ball Blue Book you can find Instructions, How-To's, Recipes, Lists, Charts, and much more. 200 pages with over 500 recipes including over 75 new recipes. This is the classic American guide to keeping fresh tasting food on hand. Brand new edition with a 2014 copyright date. My mom always had one of these on hand so when I started getting back to my canning roots I decided I would get one too. I have had to go back to this book time and time again for over three years now and don’t know what I would do without it.